HELP US RAISE $50,000 FOR THE CENTER FOR GREAT APES All donations go directly to the Center for Great Apes - all costs are borne by ENDANGERED: Art for Apes. We are working with the internationally acclaimed Belgian photomosaic artist Joël Moens de Hase to produce a unique portrait of PONGO, arguably the Center's most handsome orangutan, made up of 5,000 photographs of CGA supporters. On the left is an example of Joël's photomosaic work. 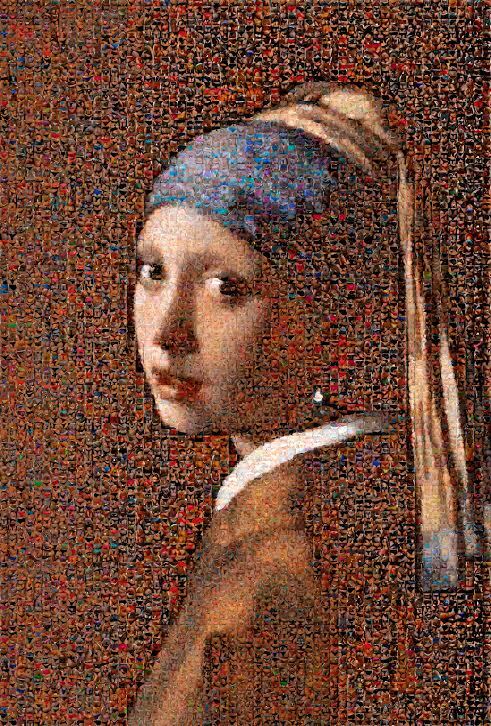 This classic portrait entitled Vermeer is made up of thousands of tiny photographs. In this picture the tiny photographs are actually images of feminine curves (we are NOT doing that). Our portrait will be made up of portraits of CGA supporters wearing something ORANGE for Orangutan "Selfies" are fine! Take a head & shoulders "SELFIE" or photograph - with something ORANGE - it could be your hair, an ornament, makeup - feel free to use your imagination and please be family friendly. DONATE $10 online AT THE CGA WEBSITE. Please write Photomosaic in the Additional Comments section. All donations go directly to the Center for Great Apes - all costs are borne by ENDANGERED: Art for Apes. Please read the MODEL RELEASE. By sending your photo to photomosaic@art4apes.com you are agreeing that you have read and understood the contents and consenting to the inclusion of your photo in the photomosaic. Once we have reached the required number of Selfies, we will forward them to Joël Moens de Hase who will use his skill and creativity to create a portrait of PONGO. When it is finished we will send you a low-resolution image of the portrait to the email address you gave us so you can see how great it is. We will be selling larger versions of the portrait, including limited edition signed prints, once it is completed and we will exhibit the original during Art Basel week (hopefully December 2019). Imagine your image on show during Art Basel! So please help us and email us your photograph wearing something orange now! And THANK YOU for being part of this amazing project.